Google last week announced its first two ‘hackathon’ events for Google Glass developers, and the company is aiming to make its wearable glasses technology something that can be used by anyone at any place. Except that this is already happening as you’d have seen if you took the downtown train in New York on Sunday, as Brooklyn resident Noah Zerkin did. Zerkin, who is a wearable technology and augmented reality enthusiast, ran into Sergey Brin and chatted with “the most powerful man in the world”. 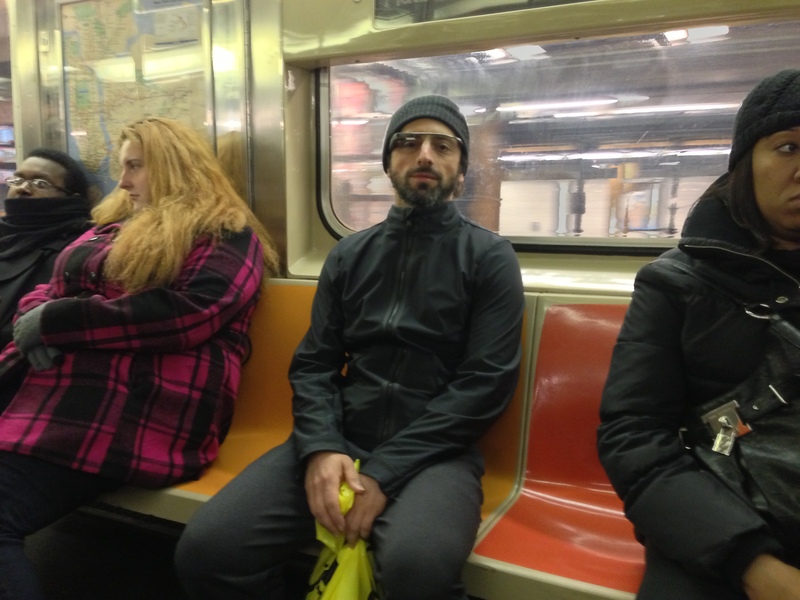 As the photo that he tweeted shows, the Google co-founder was sporting a set of Google Glass specs out in public, as he is known for doing. That a man as fabulously wealthy as Brin uses the train to get around is quite amusing. With his winter hat, beard and plastic bag, he looks just like a regular guy. Albeit one rocking a $1,500 set of glasses. It’s pretty incredible to think that this technology — which was unveiled last April and demoed at Google IO in June when Brin showed a video of him skydiving with a pair — is being worn out and about among ordinary people, many of whom probably have no idea what it is…let alone how much it is worth. Is this a glimpse of the future when ordinary folks are wearing Google Glass while doing everyday activities…? Brin will certainly hope so. Update: When we asked Zerkin what he talked about with Brin, he gave us an account that he preferred to remain off the record (no problem). But, now he has opened up and blogged about it (here) if you’re curious to know more.